Willie is a small, 2-year-old black and white male born October 2013. He is tattooed as the "L" pup, but his registration number is too faint to decipher. 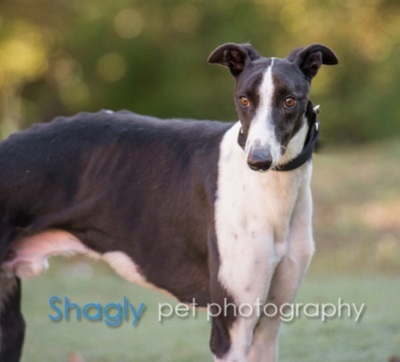 Willie was brought to the Humane Society of North Texas as a stray. His initial bloodwork shows him to be heartworm positive, and we are waiting on the results from the Protatek test for tick-borne diseases. Willie is very thin, weighing only 44 pounds, so he will need to gain some weight before he can start his heartworm treatment. Willie has passed an initial cat test, and is living in a foster home with small dogs. Willie's Protatek results for tick-borne diseases have been received, and he is negative to Ehrlichia Canis, Babesia Canis, Rocky Mountain Spotted Fever and Lyme disease. Willie is having some complications at this time with a severe upper respiratory infection. He is under the care of Dr. Aaron Wages of VCA Preston Park Animal Hospital and is being carefully monitored with his heart disease. He will have to recover from this infection and gain some more weight prior to starting his heartworm treatment. 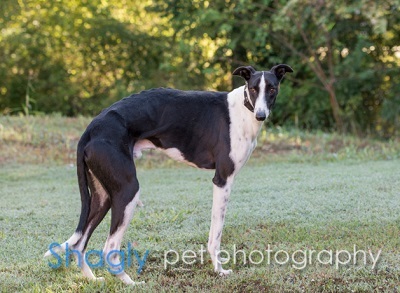 He has gained almost four pounds since arriving to the GALT family. X-rays reveal that Willie has bacterial pneumonia. His medication has been adjusted accordingly. His foster home is keeping him very quiet. He will not be able to start treatment for his heartworms until this infection is cleared up. Willie received his first injection of Immiticide for his positive heartworm infection. He tolerated the procedure well and is being kept very quiet in his foster home at this time. His next treatment will occur in approximately 4 weeks. Willie received his second round of heartworm treatment. He will be kept quiet in his foster home for the next 60 days. Willie's heartworm test shows positive, so it will be another 4 weeks and he will be retested again. His foster home continues to keep him quiet. Willie is finally heartworm negative, and he has completed his medical procedures! This boy is ready to find his forever couch!